On Saturday 14th January, breeders of the top British-bred horses from around the country converged in London at the Grange City Hotel, for the annual British Breeders Dinner and Awards Ceremony, organised by the British Horse Foundation. 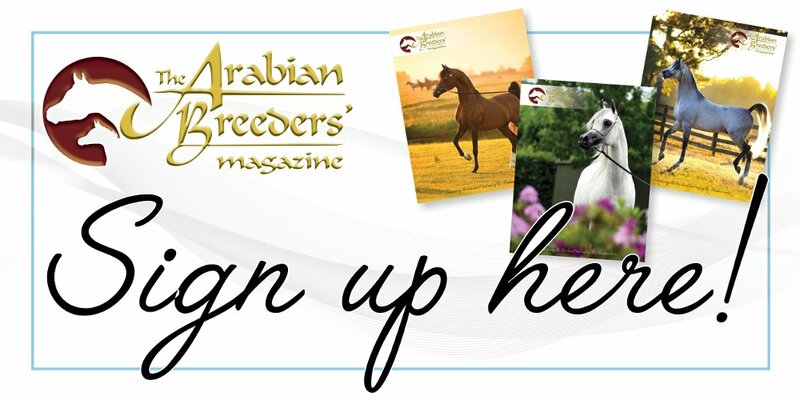 There has been much to celebrate for British Breeding in 2016 and this glittering occasion affords the breeders of these potential world-class horses the special recognition they deserve. Guests arrived at the Competition Stallions-sponsored drinks reception before moving on to a sumptuous four-course dinner, followed by invited guest speaker Henry Bullen, Managing Director at Peden Bloodstock who gave a very entertaining and insightful speech of the planning, preparation and logistics of transporting horses around the world and the complexities they have been faced with and how they over came them. The evening then moved on to the much-anticipated Awards ceremony, compéred by event commentator Mike Tucker. Young, professional and amateur breeders were well represented throughout the Awards Ceremony in the Baileys Horse Feeds/British Breeding/BEF Futurity Certificates of Merit. Winners included Barbara Heaton Smith who was presented with two certificates for CAWrus Boy, eventing foal and CAWrus Girl, eventing 2 year old as were joint breeders Mrs R B Skepper and Mrs P G Marson for Heritage Vadel, endurance yearling and Heritage Arrakis, eventing 3 year old. Certificates of Merit were also awarded for the highest scorers in each age group at the Futurity Eventing Championships held at Osberton. In the Futurity age awards, Sarah Oppenheimer picked up the foal award for breeding Headmore Valentina, a potential dressage prospect. 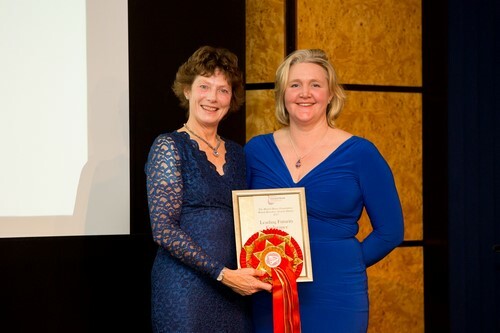 Jane Townshend collected the yearling award for Classictop Up & At It, an eventing prospect. The two-year old award went to showjumping prospect Balou for Pleasure bred jointly by Lisa Maynard and Chris Jackson with the three year old award going to Millfield Counterfeit bred by Sue Jagger that is destined for a show jumping career. Young horse awards were then presented to breeders of the best British bred young horses in the three main equestrian disciplines; Dressage, Eventing and Showjumping. The Young Horse Awards for the three disciplines saw a range of breeders step forward to collect their awards. Amongst the winners was Judith Davis, who bred both Hawtins san Floriana (4 year old) and Hawtins Barolo (5 year old), winners of the dressage awards with F J Veyron, bred by Fiona James taking the 6 year old dressage award. The Billy Stud collected the seven year-old British Eventing Young Horse Breeders Medal On for Billy Walk On – and the 6 year-old showjumping award for Billy Penny. Andrew Doswell and Kevin Cooper collected the 5 year old showjumping award for Kesera 22, with Sarah Williams collecting the 7 year old award with Sirocco VII. The Horse & Hound Outstanding Mare Award went to State Premium World’s Finest, owned by Judith Davis of Hawtins Stud, who was thrilled to be the recipient of this prestigious award for one of the stud’s foundation mares, who has created a lasting dynasty through her daughters and their offspring. 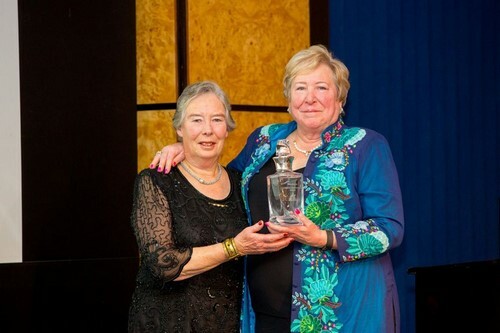 Janet Willis was the recipient of the British Grooms Award that was open to all grooms in the equestrian industry; with Georgie Thomas being awarded the runners-up prize, both from the world of eventing. The British Equestrian Grooms Award was open to any groom who supported any British Equestrian Team athlete at the Rio 2016 Olympic and Paralympic Games with the award going to Mark Beever groom to Nick Skelton who rode Big Star to win the individual showjumping gold medal. The Yard Manager Award was presented to Marcelle Tattersall, mother and lynchpin to GB Olympic event rider, Gemma Tattersall, with the Apprentice Award going to Elizabeth Killick who is based with dressage rider, Matt Hicks. The culmination of the evening was the Meritoire Liftetime Achievement Award; this annual award is presented as recognition for a lifetime’s contribution to the breeding industry… The Award was presented to Desi Dillingham MBE. Image: Desi Dillingham MBE receives the Meritoire Award from Jennie Loriston Clarke. Credit Craig Payne. Baileys Horse Feeds/British Breeding Futurity Awards presented by Baileys Marketing Manager Jane Buchan. 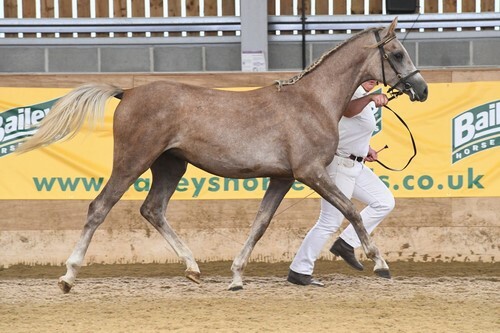 The Futurity series is designed to assess young horses and ponies from foals to three years for potential as performance sport horses and ponies of the future. Futurity Certificates of Merit for the highest scorers in each age group and discipline.